This page is dedicated to providing the site visitor with quality Elvis Presley biography fan`s survey results information from the site`s Elvis Presley Quiz, pictures and articles for your entertainment. The contents of this Elvis Presley site is written by a fan for his fans. If you recently submitted your fan survey to the site, it will soon appear on its own Elvis Presley website page like this. : What's it like it like to have all that money and all thoes ladies???? 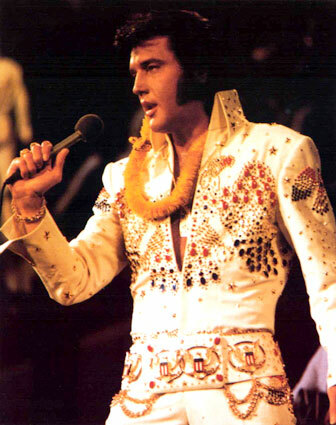 Thank you for your comments on our survey, Elvis was a great performer. He was just so electrifying` He would give his fans his very best..
Now, more than 25 years after his death, Presley remains a foremost pop icon of the 20th century. His image, especially his trademark forelock, is instantly recognizable. He is still the gold standard against which modern notions of fame are measured. At least one modern recording artist, Elvis Costello, borrowed Presley's first name to help his fledgling career. But all too often Elvis Presley's kitsch appeal and the industry which has grown up around it, chronicling his dietary and chemical predilections and the trappings of his celebrity, have tended to obscure the vibrant and vital music he made as a young man, the vocally-influential recordings of his later career, and the lasting influence both he and his music had on American popular culture. Connected with this is a continuing urban myth that Elvis is still alive. "Elvis sightings", in which Presley is reported to have been located (frequently in mundane and out-of-the-way places, such as a supermarket in South Dakota), are common events, and one of the staples of supermarket tabloids. However, interest in his music returned during the buildup to the 2002 World Cup, when Nike used a Junkie XL remixed version of his "A Little Less Conversation" (credited as Elvis Vs JXL) as the background music to a series of TV commercials featuring international soccer stars. The remix hit Number 1 in over 20 countries, including the United States, the United Kingdom and Australia (it was also his first top 10 hit in the UK for nearly 22 years, and his first #1 there for nearly 25 years). At about the same time, a compilation of Presley's US Number 1 hits, ELV1S: 30 #1 Hits, was being prepared for release. "A Little Less Conversation" (remix version) was quickly added as the album's 31st track just before its release in October 2002. Nearly 50 years after Presley made his first hit record and 25 years after his death, ELV1S: 30 #1 Hits reached number 1 on the charts in the US, the UK, Australia and many other countries. A re-release from the album, "Burning Love" (not a remix) also made the Australian top 40 later in the year. His renewed fame continued with another remix in 2003 (this time by Paul Oakenfold) of "Rubberneckin'", which made the top 3 in Australia and top 5 in the UK. This was followed by another album called 2nd to None, a collection of his B-sides, including the "Rubberneckin'" remix. In mid-2004, to commemorate the 50th anniversary of Presley's first professional recording, "That's All Right", the recording in question was re-released, and made the charts around the world, including top 3 in the UK and top 40 in Australia. In early 2005 in the United Kingdom, RCA began to re-issue his 18 UK #1 singles as CD-singles in the order they were originally released, one of them a week. The first of these re-issues, "All Shook Up", was chart ineligble due to the fact that it was sold together with a collectors' box which holds all 18 singles in it (it actually sold enough to be #2). The second of these re-releases, "Jailhouse Rock", was the number one in the first chart of 2005, and "One Night/I Got Stung", the third re-release in the series, replaced it on the January 16 chart (and thus becoming the 1000th UK number one). However, the fourth re-release, "A Fool Such As I/I Need Your Love Tonight" was beaten the next week by Ciara's "Goodies" at the end of the respective sales week, leaving him at #2 (even though he had been leading throughout most of that week). He was beaten due to the fact that these re-releases were "limited edition", and not as much could be sold to keep it in the lead on that weekend. Due to this, RCA is now pressing more copies of each re-release single. These re-releases are breaking many chart records there, making Elvis the only artist so far to spend at least 1000 weeks in the top 40 (coincidently, he broke this record on the week he held the 1000th UK #1 song), but they have also made him break the record for the biggest drops from the #1 position. A further 14 Elvis singles are due for re-release.